This week's question is: Summer is coming quickly - what 2011 summer release are you are most looking forward to? 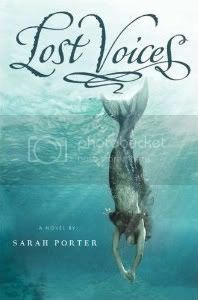 I love mermaids, and I love that the mermaids in this book are recruited from the ranks of dangerous, troubled girls. I love the cover! I have high hopes for this book. Ah yes, this is one I'm looking forward to as well! I've really been enjoying all these mermaid stories lately. :) I'm your newest follower... please stop by my blog to follow me back whenever you can, thanks! Madigan, I actually have an ARC of this book that I'd be more than willing to part with. Despite my love for dark, darker, darkest YA books, this one didn't hold my attention. Let me know if you want it and send me your contact info. Madigan, I'm looking forward to this one too! It's nice that it's available in netgalley - I must remember to read it soon! I'm inviting you over at my blog for a chance to win Forgotten & Playing Hurt. I love both books and I'm sharing the book love through these contests! What is it about mermaids? I dunno, I'm just enchanted by this one. Never visited before....love your blog name....nice and personal. Stop by my blog if you like so you can see my answer to this week's question and to enter my giveaway of DANCE LESSONS.